One of the greatest Medieval Cathedrals still standing. 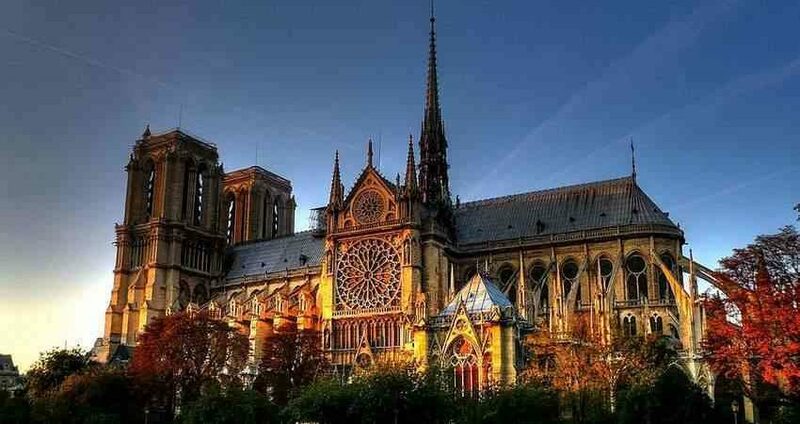 Compared to other cathedrals, Notre Dame stands out. The three doorways have beautiful deep ogives, which show how thick the walls are. On the facade and sides of the cathedral, episodes of Sacred Scripture are illustrated in stone. On the roof we see a spire. It is the famous spire of Notre Dame that offers a backdrop of lightness, grace and grandeur to the unfinished towers. The spire is magnificent! The cross on the top has an elegance that defies words. It is beyond marvelous. But the cathedral was never completed. The two main towers should have been taller. But the gothic style died under the accursed breath of the Renaissance and Humanism. As a result, the towers are incomplete. A pleasant impression is caused by the contrast between the cathedral's height and width. Notre Dame is slender, tall, much taller than wide. However, its width is sufficient to make the edifice look solid. It is gracious, light, and it has an indisputable air of a fortress. It expresses the plenitude of the Medieval spirit: hierarchical, sacral, ordered, where everything is turned towards what is higher, where the most grave seriousness blends perfectly with the most delicate refinement, and with the most extreme distinction. The most beautiful aspects of the Catholic soul are reflected in every angle of the cathedral. There is something of the glory of the Resurrection of Our Lord Jesus Christ in the triumphal air of Notre Dame. Note: This post is based on commentaries by Prof. Plinio Corrêa de Oliveira.